Wildphinn » Who is Wildphinn? 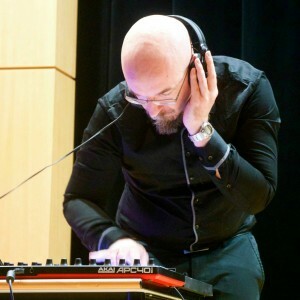 Wildphinn (real name Lionel Davoust) was born in France in 1978, in the golden age of electronic music, just as synthesizers became widespread. He very soon developed a liking for melody and long, evolving atmospheres; as a kid, he wanted to learn the piano, but gave up when nothing but dry music theory was offered to him. As a teenager in the 90’s, while his friends listen to rock and pop, he prefers progressive, sequenced electronic music such as the likes of Tangerine Dream and Jean-Michel Jarre. A natural interest for a passionate player of video games, fascinated by computers. He spends long hours decrypting live footage and videos trying to understand how all these knobs and faders work, and eagerly reads magazines where he discovers the mythical machines of the times – ARP’s, Prophets, Korgs and the like. He wants to do electronic music. Being an avid gamer, entranced by computer demos and their soundtracks, he tackles trackers and MODules; and switches to MIDI as soon as he gets his hands on more serious hardware, learning the workings and the joys, but mostly the difficulties, of sequencing and mastering on personal equipment in these days – a valuable learning experience that will never cease to prove useful. Very quickly, still in his teenage years, he starts making short movie and marine documentaries soundtracks in the amateur sphere, earning quite a bit of recognition under a different alias. More music videos than narrative stories, some of them are shortlisted in various competitions. Time passing, he manages to acquire a bit more gear, learns classical subtractive synthesis and the intricacies of sound design. He plays several short solo gigs and in a few amateur bands, mostly heavy or gothic metal. As a student in marine sciences, he also earns two MSc’s, but he knows the research field is not for him and does not pursue with a PhD. He wants to create. In the 2000’s, still playing and experimenting, he develops his career of professional fiction writing (in French) in fantasy and science-fiction, where he is building a solid and faithful readership. Music never leaves him, though; he learns some guitar, keeps playing on his gear, learning music theory, stacking countless ideas, covering some loved tracks from favorite video games, listening and listening again to everything that has a sense of epicness – video game music, trailer music, progressive trance – but never releasing anything as he feels he is still lacking the means to complete his dream projects because the hardware only remains available to top-end studios. Come the 2010’s. This is an age of DAWs, of virtualization, of emulation, of controllerism and wacky interfaces, of affordable home studios. 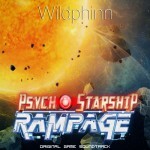 Using all his experience, Wildphinn rebuilds his studio around computers and soon starts working on his first professional project, another dream – the soundtrack and sound design of an independent video game, Psycho Starship Rampage !